The Yankees acquire the Marlins slugger. There’s a new powerhouse in the MLB and it’s a familiar one, the New York Yankees. In a trade with the Miami Marlins the Yankees acquired star RF Giancarlo Stanton. In turn the Marlins got Starlin Castro, Jorge Guzman, and Jose Devers, but most importantly got rid of the $295 million owed to Stanton over the next decade. Many Marlins fans are upset with the trade and feel they could have gotten much more out of Stanton. Some are even questioning the leadership of new owners Bruce Sherman and Derek Jeter. Whether or not the Marlins made the right trade remains to be seen, but as of right now it seems Derek Jeter gave his old team a gift in Stanton. This is a huge pickup for the Yankees, who add to an already powerful lineup that made it all the way to the ALCS last season. Stanton was last season’s NL MVP with a whopping 59 home runs and 132 RBIs, leading the league in both categories. The joins last season’s AL rookie of the year, Aaron Judge. Judge was also second in the league in home runs last season behind only Stanton himself. This new duo of two of the biggest hitters in the league is a scary thought for any opposing pitcher next season. 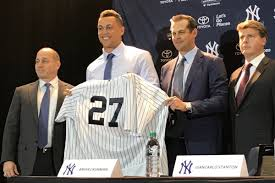 Both Judge and Stanton are still young, age 25 and 28 respectively, so this could be the beginning of a long stretch of good years for New York provided that they can hang on to both stars, which shouldn’t be hard for the richest team in the league. “I’m so happy we got Stanton, with him and Judge we’re looking like a championship caliber squad,” said Yankees fan Christian Giordano. Unfortunately for the rest of the MLB, the Yankees appear to be back on top of the baseball world and may not be coming down anytime soon.